Last night human rights workers learned that there were going to be demolitions of houses in the Jerusalem district today so we travelled to Al ‘Isawiya. When we arrived we found that the house had already been destroyed and that the bulldozer had come at 5am. The father of the family was there but the children and mother were all ’sick’ – stressed by the events of the day. This is the second time the house has been knocked down – they were told if they paid $10,000-20,000 it may be saved but of course they do not have that money. They had rebuilt it after the last demolition simply because they had nowhere else to go. This family will now move into another house next door which other members of their extended family live in – the reason they had moved out is because there were too many to fit in this house – now 6 people will have to move into a house with a similar number. The space available to them is pretty small as it was, so this is going to make the situation even worse. Luckily they had enough time to retrieve almost all their belongings before the house was knocked down. HRWs were also present later at a house on the Mount of Olives while the demolition took place, but police would not let internationals anywhere near because of ‘orders’. When questioned, one of the soldiers pushed a journalist for no real reason, only a small push, but still it is unacceptable as he was not trying to pass the soldier at the time, simply trying to ascertain why he was not allowed past. One police officer said that before this house, they demolished a Jewish house and were going onto another Jewish house, in fact a lot of the houses they knock down are Jewish. Of course she was vague on details and we replied we had never heard of this – one person in the group has researched this extensively, but she said see had seen different research. They then said we can take pictures from where we were, although the house could not be seen from this position. Eventually some got onto the roofs of other properties but most of it was over. The soldiers and police who were there were all patting each other on the back and shaking hands – job done. The children were there and some of the grown men had tears in their eyes. Other houses in this area have been bulldozed recently as well, and some residents seem worried that still more houses might be next. This month has seen a large number of properties bulldozed in the West Bank, and with many other properties threatened, more are likely in the near future. Since the start of 2004 234, and so far this year 36 Palestinian houses have been demolished in Jerusalem alone. A family home in Walaja, west of Bethlehem, was destroyed for the third time today. In the space of two weeks, the Israeli occupying army has come to the village of Walaja at least three times. The first time was to demolish an outbuilding that housed animal feed. The second, last week, was to arrest a father of five during the night for apparent links to political party Hamas (he works for a Bethlehem orphanage supported by the social services part of Hamas). The third was this morning when they came to demolish the home of Monder Abed Hamad and his family, for the second time. The family have the misfortune to live in the Ein Jwzeh neighbourhood of Walaja, part of the village that was unilaterally taken into the borders of Israel after the 1967 war. About one year ago their home was demolished as it did not have an Israel building permit, the fact that it had a Palestinian permit makes no difference- this part of the village is now deemed to be “Israel”. 20 other homes have so far been demolished for the same reason, and a further 50 have demolition orders on them. As the family own this piece of land, and could not afford the Israeli permits even if the courts would grant them one (which is highly unlikely) they rebuilt their home with help from the rest of the village. The rebuild was completed around 5 months ago, today, in around two hours the home was again reduced to rubble and a pile of belongings. Today the family will move into rented accommodation, whether they will once again try to rebuild their home is unsure: their land lies along the route of the Israeli apartheid (security) wall that is set to completely surround the village. None of this is new for Walaja just the latest chapter in a long story of injustice, as one of the residents of Walaja commented “…it’s always the same picture for us”. All of the inhabitants of this village are classed as refugees: they were forced from their homes after the 1949 ceasefire between Israel and Jordan. Unfortunately under this agreement, the village of Al Walaja lay in the area under Israeli control and they were “encouraged” to leave. All of the inhabitants left their homes and the village moved just a few hundred metres south, still on Al Walaja land, into the area now known as “the West Bank”. The Israeli colony of Aminadav and a park was built over the original village. Not all of the villagers were able to rebuild their homes at this time, many moved into the refugee camps that surround Bethlehem, or over the river into Jordan. Those that were able to rebuild their homes and lives did so on the slopes south of the original village. After the 1967 war Israel expanded its borders, taking more Palestinian land and Al Walaja fell back into the area controlled by the Israelis, an area now known as “Greater Jerusalem”. This doesn’t mean that the villagers got any of the perks of being an Israeli citizen like the ID cards that allow them to travel around their own country relatively easily. What it does mean is that one third of the new village’s land was taken and the Gilo colony built there, in the rest of the village 70 houses have demolition orders on them, 20 so far have been destroyed- they had Palestinian building permits, not Israeli ones. It also means that the village is now surrounded by the Israeli colonies that are cutting the city of Jerusalem off from the rest of the West Bank (i.e. making Jerusalem an entirely Israeli city). As such, they have lost much of their land, and are destined to lose much more. It also means that as the villagers are now living in “Israeli Greater Jerusalem” but have Palestinian ID cards, they are subject to frequent harassment and arrest by the Israeli army. As Walaja is surrounded by Israeli colonies the so called “security-wall” is set to completely surround the village, cutting it off from Bethlehem and confiscating yet more of the village land. The land lost by Walaja and neighbouring Battir village will be used to build the colony of Giv’at Ya’il. This huge colony will house around 50,000 Israelis and will link the colonies deep in Palestinian territories with those immediately outside of Jerusalem. Could it be a coincidence that this land confiscation has allowed the separation of strategically and spiritually important Jerusalem from Palestine? So what does the future hold for Walaja? When the wall is finished the villagers will have to pass through an Israeli controlled gate to get in or out of the village. 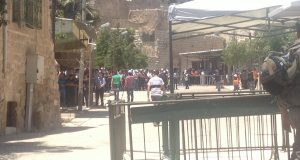 To get into the city of Bethlehem where many of the villagers work, attend school or university and buy supplies, the villagers will have to pass through two checkpoints. The route of the wall passes through many economically important olive groves, already three hundred trees have been destroyed. This in itself is an infuriating story. The villagers had gone to court to try and prevent the destruction of their trees. The Israeli court had ruled in their favour, saying that the trees could not be “up-rooted”. In an act of barbarism and disrespect that typifies the army’s response to the rare court orders granted in favour of Palestinians, they came with chainsaws and cut down the trees instead of digging them up, thus complying with the order to not up-root the trees. And so life here goes on…as the democratic state of Israel, whilst demanding that groups like Hamas agree to its right to exist, quietly makes life for Palestinians in what little they have left of their country, unbearable and next to impossible. Internationals have been banned by the IOF from visiting the land of Bil’in village that lies on the other side of the illegal apartheid wall. In recent days internationals have been told by soldiers stationed at the checkpoint at the wall cutting through the village, that orders have been given forbidding access to this land. For the past year internationals have been able to cross the wall to visit and stay at the outpost built on village land and to help work the agricultural land. Settler-colonists from the illegal colony of Matityahu East have in the past set fire to the outpost, making the need for a permanent presence at the outpost essential. In the past year the outpost has served as a meeting place for villagers and friends, has been a focus for the enjoyment of the World Cup and internationals helped with the olive harvest on the other side of the wall. All these displays of friendship and international solidarity have now been brought to an end in this latest attempt to ghettoize the village. Half of the village land has been annexed by the Israeli colony of Matityahu East and now the village is being denied their right to use the remaining land across the wall as they wish. In a rare piece of ‘good news’ for the village, Emad Burnat, the Reuters cameraman fitted up, assaulted by soldiers, denied medical treatment and slung in jail for 3 weeks has been released from house arrest and can now return home to his family in Bil’in. Press watchdog Reporters without Borders drew attention to Emad’s arrest and the trumped-up charges brought against him for his role in documenting IOF violence and intimidation in Bil’in. Amnesty International’s Secretary General Irene Khan today called on European Union Heads of State and Government to urgently address the downward spiral of human rights abuses in Israel and the Occupied Territories. In an open letter published on International Human Rights Day and ahead of next week’s meeting of the European Council (15 December), Irene Khan made a series of concrete recomendations including the deployment of international human rights monitors to the region. Irene Khan is currently leading an Amnesty International mission to Israel and the Occupied Territories during which she has discussed human rights concerns with government officials and members of civil society. The letter’s recommendations are elaborated on in a briefing also published today, Israel and the Occupied Territories – Road to nowhere. * Concrete provisions to ensure the removal of Israeli settlements from the Occupied Territories, the dismantling of the fence/wall inside the West Bank, ending the closures and in the long term a fair solution to the refugee question. This Travel Warning is being issued to update information on the general security environment in Israel, Jerusalem, the West Bank, and the Gaza Strip, and to reiterate threats to foreign nationals, especially American citizens. Although the situation in Israel is seemingly calm, the fact of the matter remains that Israel continues to aggressively violate International Humanitarian and Human Rights Laws daily. A disconcerting development is the Israeli practice of denying entry of Palestinian Christians and Muslims to the Holy Land; embodying religious discrimination during the high holy season. As Palestinians, we have always looked forward to your being with us during Christmas, Easter and other holiday feasts. In the past, it has been a time to welcome you into our land, our churches, our mosques, and our homes, despite the troubled times we have witnessed throughout the decades. bridges and sent back to their country of residence or to Jordan. The Israeli authorities seldom give a reason for barring foreign tourists, so people find themselves spending money to fly into the Israeli airport or come to the Israeli-controlled border crossings not knowing that they may be turned away without having the opportunity to visit the Holy Land or visit their friends and families. If this Israeli policy is allowed to continue it can literally empty Palestine of another half a million Palestinians. Given that four decades of Israeli occupation have already successfully reduced the Christian population in Bethlehem from 15% to less than 2%, it becomes clear that Israel’s goal is to reduce the entire Palestinian population to insignificant numbers. We would like to welcome you to Bethlehem in occupied Palestine this Christmas season. However, to avoid spending money unnecessarily and facing a humiliating experience, we recommend that you call the Israeli Embassy or Consulate nearest you before embarking on your trip this Christmas season. Please ask the Embassy or Consulate if you will be able to pass through the airport or via one of the bridges from Jordan in order to reach Bethlehem, particularly given the fact that thousands who are trying to reach the Israeli occupied Palestinian territory are being turned back. While speaking to the Israeli Embassy officials, confirm that Palestinians – Muslims and Christians – have not been allowed to worship in their holy places for many years. In fact, no Palestinians from the West Bank and Gaza have been allowed to enter Jerusalem without Israeli military permission since 1993 and very few are granted permits to enter Jerusalem, whether for worship during Lent, Advent or Ramadan. The building of the illegal Israeli Separation Wall (which is mostly built on Palestinian lands acquired by force 1967) has made it even more difficult for Palestinians and internationals to travel to Jerusalem and Bethlehem. The Separation Wall has not been built for security reasons, but rather to separate people from one another, from their livelihood, from their places of worship, and from their future. Walls do not create the conditions for peace with justice. Historically, walls separate and divide and bring widespread despair, which we are witnessing now. Although the U.S. State Department’s Travel Advisory for this same area “urges U.S. citizens to defer travel to the West Bank and to avoid all travel to the Gaza Strip,” we would ask that you rather not despair and actively attempt to join us in Bethlehem and Jerusalem this Christmas. If we acknowledge the international community’s concurrence to allow Israel to get away with denying the world’s citizens the right to worship and blatant, daily violations of human rights, then we would all be accomplices to the war crimes being committed against Palestinians. Thus, we hope to see you all this Christmas season. Please contact us when you are here so we visit and worship with you. You may contact us either via email at info@righttoenter.ps or mobile at 059-817-3953. Palestinians in your prayers and actions this holiday season. I have been back in Palestine for a week. Although the violence and tension is less than in the early years of the Intifada, the oppressive control of Palestinian life is worse than ever. People are losing hope. Despite this, I feel so fortunate to be here during the olive harvest and have been welcomed with incredible generosity and open heartedness. I have climbed olive trees and experienced the beauty of harvesting; feeling ripe olives running through my fingers, and hearing them fall like huge drops of rain on the tarpaulin below. Resting in the shade of the olive groves I have shared much laughter and amazing picnics with Palestinian families, who despite hardship, danger and suffering retain their humanity and infectious sparkle. The olive harvest is a crucial time of year and is part of the very fabric of Palestinian society. Many farmers have suffered huge land loss and with this, mounting poverty. Land has been confiscated to build the Apartheid Wall, to expand Israeli settlements (whose very existence is illegal under International Law) and to construct “settler only” roads. Many farmers have land which is virtually inaccessible, falling behind the Wall, and have to negotiate a punitive system of permits and locked agricultural gates. Internationals offer accompaniment to farmers who are in danger, from both the Israeli Army and armed Israeli settlers. We stand in solidarity in the struggle to preserve land and livelihood. I have been working in the village of Aw Zawiya, in Salfit district, central West Bank . The Apartheid Wall is already complete on one side of the village, resulting in massive land loss. Over the coming months Az Zawiya will be imprisoned on a further two sides. Many Palestinian villages are being strangled by “Ariel finger” which cuts deep into the West Bank, forming a “land corridor” between Ariel settlement and Tel Aviv. 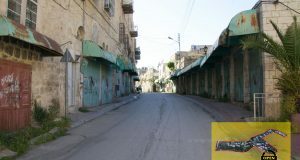 The village of Aw Zawiya will become isolated into an enclave, along with the villages of Rafat and Deir Ballut, inaccessible to currently neighbouring villages. The army can easily control the one road into the village – a tunnel running under a “settler only” road. Anyone who has any doubts about whether Apartheid is really happening need only take a look at the segregated road system. The main problems the farmers from Aw Zawiya face are from Israeli settlers. Although the settlements in that area are not particularly radical, the gun is commonplace. Whilst accompanying one family we were forced to walk for 100 meters through a dark, claustrophobic drain which ran under the “settler only” road. Shortly after emerging from the drain we met the army, controlling a small break in the Wall. An elderly man, alone and trying to reach a hospital appointment, was turned away. He did not have the “right” ID. In fact he was trying to save time and money, taking a short cut along a route that would have been possible before the Wall was built. Internationals negotiated for 2 hours with the army to be able to join the Palestinian family we were accompanying, whose land was dangerously close to a settlement. Another family we accompanied have land which now lies within an Israeli settlement. They had to pass through the agricultural gate at Mas’ha village in order to harvest their olives. Permits to reach this land are only given during limited periods during the year, and only to older people. The gate is opened and closed once a day, and does not allow for a full days work. Palestinians have no choice or control over when they go to their land. We also harvested with a family from the village of Haris. Their land was overgrown and the trees had not been pruned, a result of the farmer being unable to safely access his fields. Revava settlement was built on their land, and their remaining trees (from the 500 which were cut down) are very close to the settlement. Revava is becoming increasingly radicalised, and there are growing numbers of attacks, intimidation and threats made towards Palestinian farmers. The first morning we were met by armed settlement “security”, who made veiled threats to shoot if we did not leave. They were joined by the Israeli army. Throughout the 2 days we had many more visits from both the army and “security”, but the harvesting continued. More than in other places we could feel our international presence making a difference. This, of course, is only possible because of deep seated racism. In a village near Nablus, another group of Internationals accompanied a family to their land which now has an Israeli watchtower built on it. They had not stepped foot in these groves for 6 years, for fear of being shot. International accompaniment not only increases the feeling of safety for the farmers, but can make a concrete difference in negotiations with the army. Recently I accompanied a family to their land in the village of Orif, near Nablus. The day before they had been stoned by settlers; one man needed medical treatment. In Occupied Palestine the parameters change. I feel relief that it was rocks and not bullets. There have been many times when Palestinians have been threatened by armed settlers, and occasions when this has resulted in serious injury or death. The Israeli High Court of Justice ruled in June this year that Palestinians have a right to property, and a right to enter and work their land. The army and police are legally obligated to take action to protect Palestinian farmers and their property from attack. This ruling is a victory for the recognition of Palestinian rights. What remains to be seen is its effects on the ground. There have been several occasions this year when it has made a difference, when adequate army protection was given to farmers to protect them from settler attacks. There is still a long, long way to go before farmers have free and safe access to their land. In the meantime internationals continue to offer accompaniment, armed with our international privilege, our cameras, our phones and a copy of the High Court decision. Today we had a trip down the Jordan valley which didn’t start too auspiciously for our Palestinian contact – he had just been delayed for two hours at a checkpoint. A soldier on the way through a checkpoint had drawn a star of david in the dust of the car. When they returned the soldier wanted to know who had wiped it off and held them for two hours demanding to know. We started at a farm near the Bisan checkpoint in the north where Palestinians now find it very difficult to take their produce through to the markets they once used, and therefore now have to go to markets elsewhere. However with problems at checkpoints this is often problematic and adds huge costs to their journey making their products less competitive as Israeli trucks are allowed to use settler-only roads and bypass the checkpoints. Despite the fact that this is the Jordan valley the Israelis do have farms out here, which occupy almost all the agricultural land, and many Palestinians are angry at the amount of land that they have taken off them. Israeli settler-colonists who want to move here are given 70 dunnums of land, a house and long term loan of 70,000 USD. Companies providing electricity, telephone and water services are obliged to give them discounts of up to 75% . This obviously makes their lives much easier out here despite the fact that this is well into the West Bank. Many soldiers seem to ignore this little fact – when checking our passports one soldier said “Welcome to Israel – I hope you enjoy it here”. However it is not the case that although these settlers pay 75% less than the Palestinians, in fact the Palestinians pay nothing for these utilities. Why? Because they are not available to them – we passed a large number of houses often next to huge water tanks and electricity wires that they are not allowed to connect up to. Many Palestinians only build plastic houses or corrugated metal houses as otherwise the Israelis knock them down. In fact even these can be knocked down. Last year 22 houses were demolished in one day while around half the land in the Jordan valley is no longer available to Palestinians – it is close to Israeli colonies, environmental reserves and military training areas. Now, as an environmentalist I would normally applaud the opening of environmental reserves but actually these people live very sustainable lives and there is no reason why these areas should be, in particular, protected. This has led to the population to drop from 300,000 pre -1967 to 52,000 last year, including the Jericho urban area. Planning permission for new houses for Palestinians is impossible to get, a new school built in Al Jiftlik village is threatened with demolition, attempts to generate power are stopped. Bardala has been waiting years for permission for a water tank but the nearby Israeli colony, built without planning permission, has services described in the paragraph above. A clinic in a tent has also been deemed illegal in the past and knocked down – despite electricity lines going right by it and some more ‘permament’ buildings they are not electrified. But it isn’t in just these respects that the Israelis control the local area, they even try and control the sun, one Palestinian joked. A community project with NGO support enabled a few households to purchase solar panels to generate electricity. One man was arrested and put in prison for three days for ’stealing’ this off the Israelis, despite the fact he had documentation to demonstrate how he had come to acquire it. He was fined 300 NIS and put in prison for three days without even being able to call relatives to help out while he was away. Israeli colonists then came and looked around the house while he was still in prison. When visiting another farmer we saw the electrified fence, where the English reads, danger electric fence, but the Arabic says warning: potential death. The farmer’s daughter touched it and received a shock. The land that is fenced off was once his but was taken in around 1970. The Israelis steal this by saying that land not used in three years can be taken and redistributed, the fact that many of these people were unable to return home or were prevented from accessing their land is not important. He finds it difficult to get water all year around as the Israeli settlers get the water from the Valley, in fact he has to drink bottled water. Again the message I got was all these people want is their rights to be respected his family had lived in this area since 1920. The farmer accepted that the Jewish must live here (in Israel) but they did not have the right to take his land. He can’t see an end to this situation as both peaceful and non-peaceful means have both failed. The more time I spend here the less likely I think there is going to be peace anytime soon. Certainly if any peace deal does not remove the Israelis from most of this land and if the wall is at least not rerouted out of the West Bank then it certainly won’t be possible. At checkpoints where we were stopped we often just handed our passports to them and they handed them back a few minutes later without checking them. Often however Palestinians are forced to wait much longer than we are. Today’s demonstration in Bil’in was relatively peaceful, with less violence from the soldiers than there has been in the past. However, they still used rubber bullets and tear gas to attack Palestinian youth who threw stones in defense of their village. Accompanied by around 15 international supporters and the stalwarts of the Israeli anti-occupation movement, the villagers of Bil’in, led by the popular committee, marched against the wall. 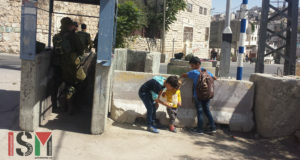 Chanting Arabic slogans against the wall, and telling the soldiers to go home in Hebrew, the demonstrators were stopped at the wall by a unit of Israeli soldiers. As usual, the gate in the wall was blocked by the Israeli forces, who had tightly wrapped razor-wire around it to prevent its removal. The demonstrators intended to pass to the annexed village land. Palestinians and their international supporters are often allowed to pass this gate during the week. However, this is changing more recently as the wall in Bil’in is now all but complete. On demonstration days (every Friday) no one is allowed to pass, however. The popular committee decided to try and find another way through the large coils of razor wire on the near side of the wall. Some of the demonstrators tried to remove the wire by pulling at this. These attempts were soon stopped by some soldiers who had followed them along the route of the wall. The area between the razor wire and the wall was held by a handful of the protesters for about 20 minutes. The soldiers prevented more from joining them. Eventually, the popular committee decided to wrap up the demonstration and called on the demonstrators to follow them back into the village as one group. On the way back, Israeli border police who had taken up aggressive positions in and near houses on the outskirts of the village began to attack Bil’in youth who had enough of them and had started to throw stones at them. The soldiers shot rubber-coated steel bullets at them, causing some minor injuries. There was also a failed attempt to use tear gas which was dispersed by the wind. When the demonstration had made it back to the village, the distinct sound of live fire was heard from the direction of the soldiers. Early this morning, I received the sad news that my mother (54 years old) passed away after serious health complications last night. I am sending this message to you and many other people around the world because I promised my mother before she died to let everybody know that it wasn’t cancer that killed her, it was the occupation. Yes, the Israeli occupation killed my mother, but this time not using missiles and tank rockets, this time using collective punishment and humiliation. Most of cancer (and other serious diseases) patients from Gaza go to Egypt for treatment because we don’t have the health infrastructure and latest technologies to do so in Gaza which is a result of the continues siege and control imposed by the Israelis over the Palestinian cities, especially Gaza . My mother was one of those patients who was diagnosed, at very early stages, with bone cancer and was supposed to go to Egypt for treatment early June 2006. Because of the collective punishment policies that Israel uses, nobody from Gaza was able to travel (in or out) to any place in the world for three months, because the Israelis control the borders. It was until August 25th that my mother was able to make it to Egypt. During these three months, I and many other people inside and outside Palestine tried to talk to International and Human Rights Organizations and ask them to intervene and help in this humanitarian situation, unfortunately, all our and their appeals failed to change the situation or to make any special arrangements. All these requests were rejected by the occupiers. By the time my mother made it to Egypt , it was unfortunately a bit late because the cancer was rapidly growing in her body and at that stage; doctors didn’t have much to do but to try the chemotherapy and to see if it can help. Unfortunately, this didn’t help much and she peacefully passed away last night. My mother is not the only case, she is just one the cases that someone could talk about. In addition to the tens of people being killed by the Israelis everyday using traditional weapons, tens, if not hundreds, others die everyday because of lack of access to health services, because of movement restrictions imposed by the Israelis and the restrictions on entering medicine and health equipment to Gaza and other Palestinian cities. Siege and movement restrictions don’t only separate patients from health services and facilities (even form local hospitals. Many women gave birth on the checkpoints and many others died before making it to the nearest hospital); they also separate students from schools and universities, believers and worshipers from mosques and churches, and families from seeing each others for many years. There are currently more than 500 checkpoints in the West Bank in an area that is probably smaller than most of the cities in the U.S., its size is around 2000 sq miles and this area is currently surrounded by the new apartheid wall. These checkpoints separate villages, cities, refugee camps and sometimes neighborhoods in the same city. These are the same restrictions that made me unable to see my family in Gaza (when I was living in the West Bank) for more than 5 years, and even when I was here in the U.S. and wanted to go back and see my mother during the last 2 months, I also wasn’t able to go because the borders were still closed (Rafah border with Egypt, which is the only gate for Gazans to the world, was open only 6 days during the last 6 months). What really breaks my heart is not the fact that she died because it’s something that everybody will experience one day and I really have great faith in God that this may be better for her, what really makes me feel very sad is that, again, because of the occupation, I haven’t seen her for more than six years and that I wasn’t even able to see her for the last time and say goodbye. It also makes me feel very sad because one of the main motives for me to do the Ph.D. was my great mother. When I was six years old my cousin got his Ph.D. and when we were coming back from visiting him my mother asked me this question (probably she was joking at that time especially that I was very little and probably wouldn’t even know what the Ph.D. is, but I know she meant it), she asked me “would you do it for me one day and get your Ph.D.?” I kept this in my mind and heart all the time and I was always encouraged by her and her high spirit to succeed and to make it to Syracuse University to get my Ph.D. Unfortunately, she will not be able to see this day and to know that yes, I did it for her. Goodbye my great mother, you were all the time the source of my inspiration and you will always be, even in your physical absence. May God have mercy on you and bless your soul mother. Friends and colleagues, unfortunately, our world is full of similar sad and unjustified cases of unfairness and humiliation, BUT always remember, we can always make a difference if we want. Think of it and see what you can do to make others live the same way you and your children live. Even a little change can make a difference. Please don’t reply to this message, if you want to do me and my mother a favor, just forward it to anybody who wants to make a difference.